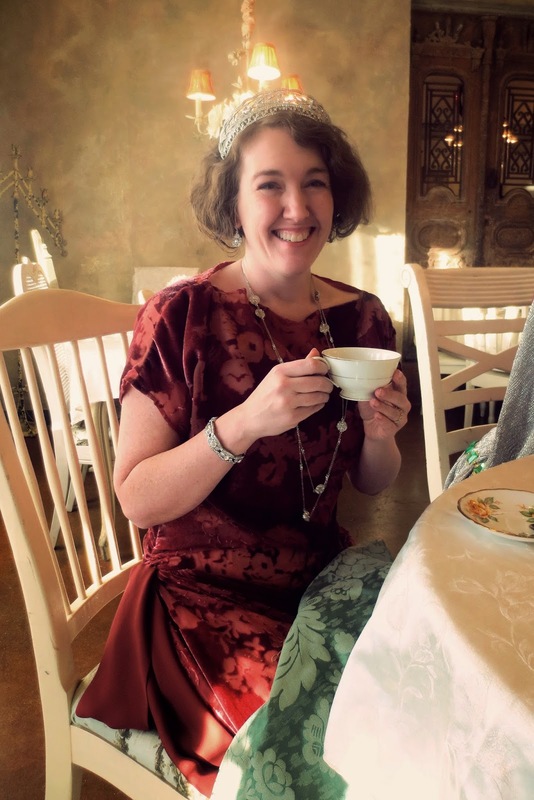 Last weekend, the Dallas / Ft. Worth Costumers Guild held a Tiaras and Top Hats Tea Party, and since I am a complete Downton Abbey addict, I decided to make an early 20's dress and indulge my inner Countess for the day. 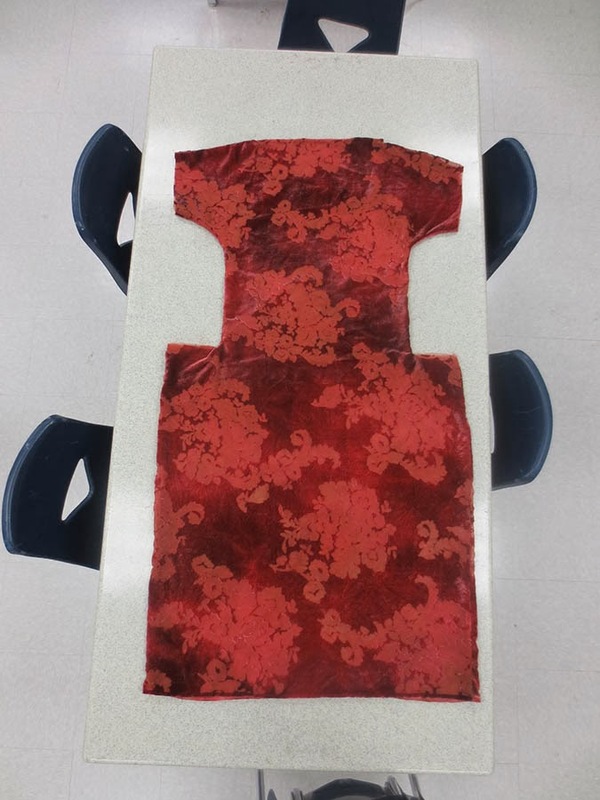 The cool thing about the 1-hour dress is that it is made out of mostly rectangular pieces and just pinned on the body to fit, so it is incredibly easy to draft and make. The front and back pieces are exactly the same, and I went one step further by using a boat neck on my gown which also eliminated any need for a curved neckline. These dresses don't look like much when they are laid out flat, but it's amazing how they come to life once they are on the body. On the right you can see my dress before I cut the angle at the hips, which I did last because I wanted to check the draping before I cut. The only real shaping in the dress comes at the hip, which is gathered a little on the torso seam to make some soft folds at the waistline, and then it is gathered at the side extensions to give some fullness over the hips. I made the hip extensions on my dress slant down, which draws up the sides and gives it a slightly curved hemline and some diagonal draping across the skirt. I also made two looped sashes out of silk georgette and tacked these onto the hips to jazz it up a little more. - I think one of the main reasons why my dress was successful was because of my fabric choice. You definitely want a fabric that is very fluid and not stiff for this style - something like silk velvet, crepe, soft lawn, etc. Drapey is definitely good! - I made my dress quite narrow through the body, which keeps it from looking like a big shapeless sack. It only has 2" of ease across the bust, and it is just big enough to fit over my shoulders, but just barely. This narrow width also means that the waistline naturally falls at my high hip (around where I wear my jeans) since it can't go down any farther than that. This is perfect for an early 20's look, and to my eyes, it is a lot more attractive than the later 20's dresses. Many of those have a waistline that hits lower on the hips, which results in the whole body needing to be cut wider for us curvy gals. - The one part about this dress that I wasn't crazy about is that the neckline likes to shift around a lot because the fabric is so slippery. I tried to combat that by sewing snaps into the shoulders and snapping it to my chemise, but it still moved more than I wanted, so I'll probably try snapping it to a firmly fitted 1920's brassiere next time. - So did the dress really only take one hour to make? Uhhh... no. 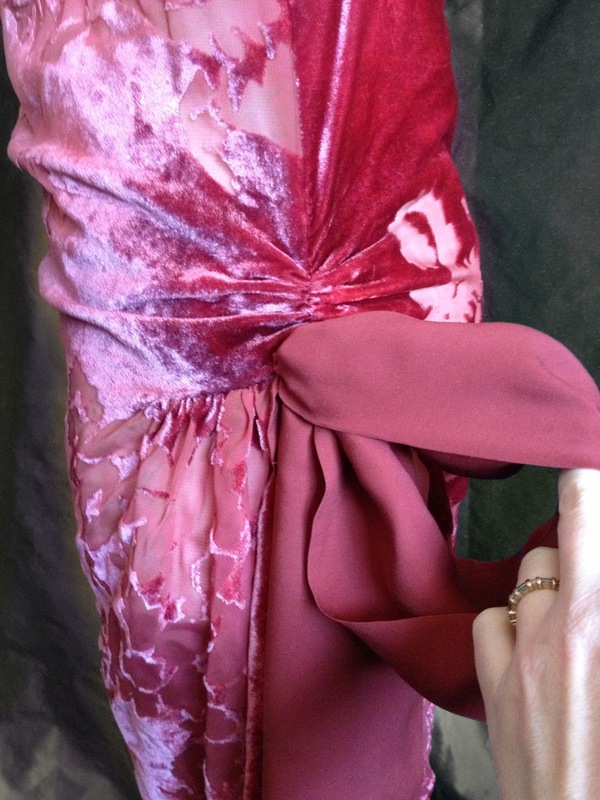 But that's mainly because the silk velvet forced me to baste everything before sewing, and I took the time to hand-finish all the hems and bind the internal seams. I probably spent about 4-5 hours on it total. But if I was making this sort of dress in cotton and machine sewed all the finishing work, I think I could get pretty close to that 1-hour timeframe. - And just because I am totally in love with my new tiara, I thought I'd let you know that I bought it from Venus Jewelry on ebay. 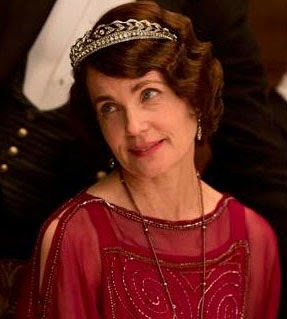 I think it is a pretty great match for the type of tiara that Cora wears in the latest season of Downton Abbey. 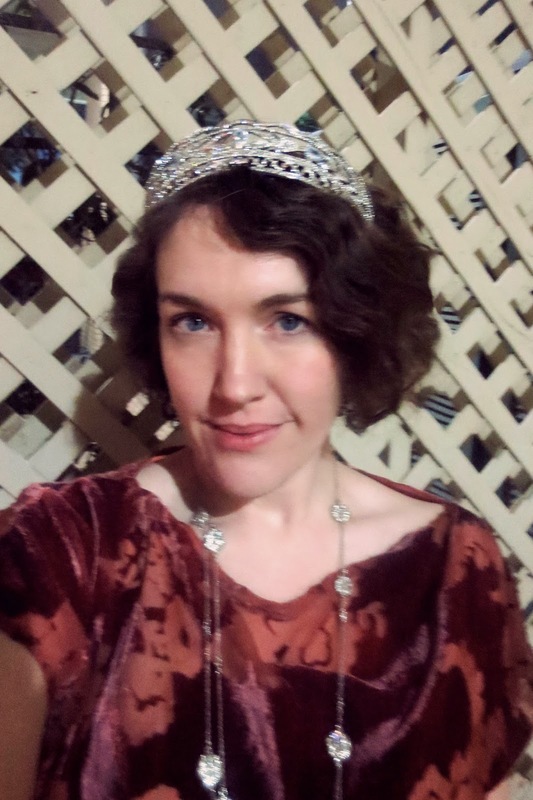 One of the best parts about 20's fashions is all the fabulous jewelry from that era, and I had a ton of fun picking out sparkly things to finish off my outfit! I wish I had a better non-blurry picture, but maybe you can get the basic idea here. So that's pretty much it! 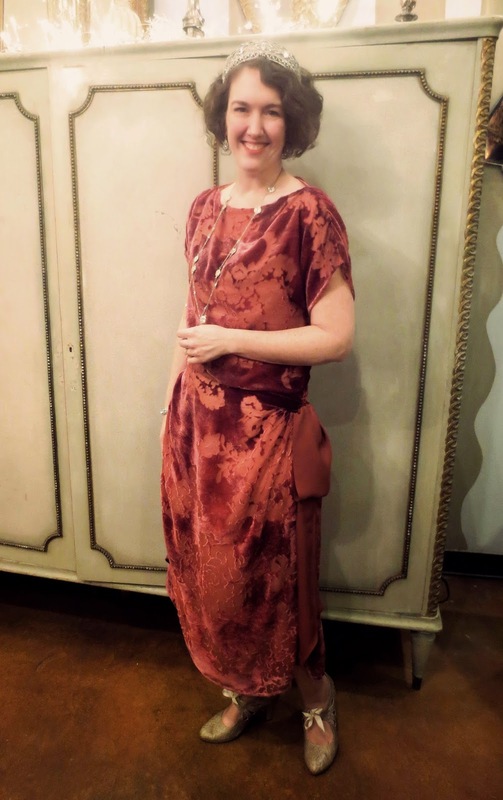 We had a wonderful time at the tea party, and I am even more in love with 20's fashions than I was before. If you ever need a quick and easy frock for your own Downton Abby adventures, I definitely recommend that you give the 1-hour dress a try! I've kind of been dithering about whether or not to get a Venus tiara, after hours of drooling over all of them, but I think you have convinced me. Your dress turned out beautifully. And, I must thank you for enabling me. I went directly to Amazon and browsed all they have from the Women's Institute and downloaded some free ones and put quite a few more on my wish list. I then went to Ebay and browsed what they have. Sigh. I really can't buy any books right now. We are remodeling and I don't need any more "stuff" to back up as we empty each room. Kindle books are another matter, though. Wonderful job on it! It looks beautiful on you. Great tips in making it too. I love it, it's such a great color on you too! You're so right, that flowy fabric makes all the difference in how flattering (or not) those dresses are. You look fabulous! Great work managing to get that out of a small remnant, the material looks perfect! Yeah!!!!! I am in love with your 20s frock!!! And I am happy that you posted about it as I am curious about the 1 hour dress. I think I will go ahead and get one of the books on ebay...yours turned out so perfectly!! The fabric is so fabulous...and your tiara is awesome! I love Venus Jewelry and Seperwar....Too fun!!! You look AWESOME! The last picture is stunning, your smile is infectious. You look like you could be Cora's younger sister! Beautiful dress, and thanks for posting the pattern and wip picture. Thank you! I desperately need a 20ies dress for 8th Februari and I don't have much time to spend on it. I'll make one like this, it's perfect! Looks great! Love your tiara too! Wonderful! Thanks for your tips, this dress might be handy for an unexpected 20's event :) And you really ARE Cora's look-a-like! OKay, I own those One-hour Dress books, love to look at them, but have been so hesitant about even considering making one of the dresses. But seeing your little beauty here really makes me want to take scissors to cloth now! It's just stunning in its simplicity. Eeeep! The fabrics, the shape, the elegance; it's an overload of total beauty! Brava! So pretty and I love how simple it is! I may have to try this. And, I have that tiara too, and totally squeed when I saw it on screen! Amazing! I love the material too. I'm so in love with both the dress and the fabric! I'd really like to read more about variations on the basic pattern -- can you please post the links to those books? Thanks so much! Hi Wendy - the links to those 3 books are in the bottom of my post... unless you have some sort of blocking software on your computer and can't see them. But you can do a search on Amazon for One-Hour Dress and find them that way too. Oops, you're absolutely right -- my adblock kept the links from showing. Sorry for the silly question! I want to move to Dallas....just to join the Dallas / Ft. Worth Costumers Guild. That is really stunning! A perfect combination of fabric and pattern, and you look lovely, too. Love it. I went to a Gabsy garden party a few years ago and had a wonderful time. Where did you get your shoes? My cousin is getting married next July and the wedding theme is Great Gabsy. Hi Rita - they are Aerosoles, but they don't carry them anymore. It was just a lucky find! This is beautiful! Kudos. I have one question, though: did you gather along the tops of the arms, or is it just the way that the fabric hangs? Thanks! Thanks for this great post! 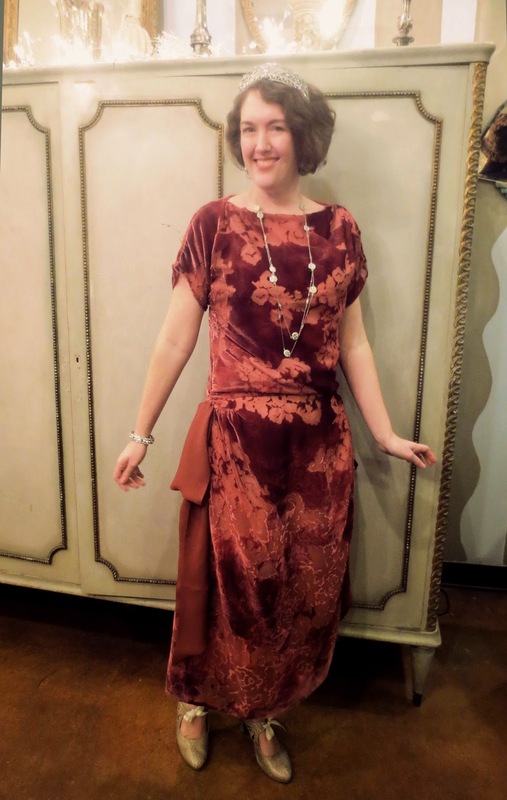 Found your blog while researching the One Hour Dress :) I mostly sew and wear 50's style clothes, but dabble in other era's and I am in need of a dress for a Gatsby Party. 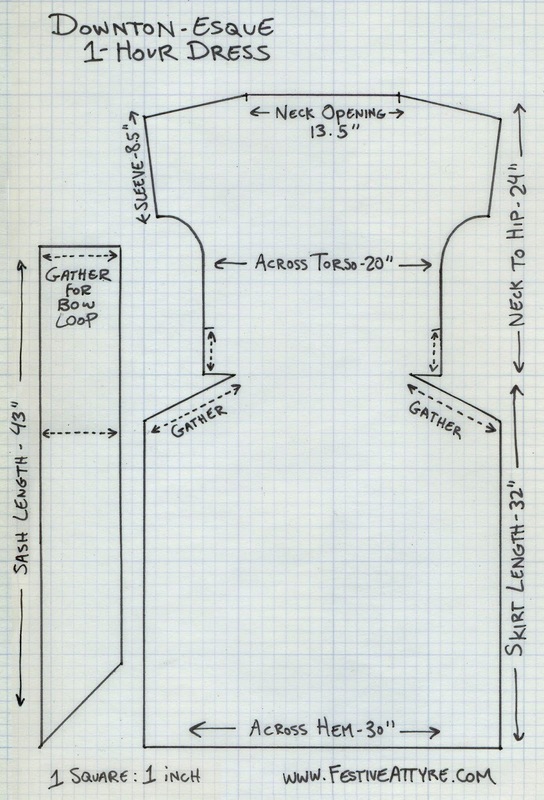 Fantastic post, love the one hour dress and yours is beautiful! Which of the One-Hour Dress books did this particular pattern come from? I'd like to make it! Such a lovely dress! Every girl needs a tiara. Even Frumpy Me has one at hand for emergencies. I know that I spent several days dithering over my one hour dress, and it was time well spent. The simpler the silouette, the more you can show off on it. And all of the One Hour Dress books are the same pattern, which you can find for free on the interwebs. I know, I think I read them all. Thank you for sharing this...it is truly AMAZING!! I want to make one just for my everyday work wear and with this pattern I can make more than one. This is amazing! Thank you! Can I print the full size on my home printer? for the love of big hair!